When people ask me to share my introduction to Afrofuturism, I usually look to my freshman year of college. As a student at Clark Atlanta University, I was befriended by a sci–fi lover from Philly who championed what I’d later know as Afrofuturism. It was the defining philosophy of his emerging adult life. In our first conversation, his enigmatic persona somehow managed to relay the connections between funk music, ancient African technologies, the minimal presence of Black people in sci–fi, and golden era hip hop’s aspirations. He was one of hundreds at the school actively engaged in these ideas. The energy of what we’d later call Afrofuturism was a dominant line of reasoning for students on the campus, nearby campuses, and the city at large who eagerly wanted to transform their communities, build a new future that valued humanity, and shed light on an overlooked past filled with incredible innovations by people of African descent. Depictions of Black people in the future were a major prong in the platform of answers. Music was a liberator. Organic food and holistic living was an answer, too. This seamless relationship between art, history, music, mysticism, and science appeared to be the keys to unlocking the destinies of lives in need of a refresh. I share this story often, because upon graduation, many of those students weren’t quite sure how their comic book–inspired philosophies on life fit in the world they were to make a living in. Not knowing the term Afrofuturism or its application was a deficit. 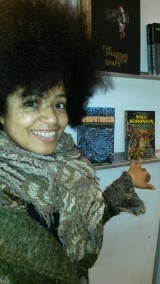 I wrote Afrofuturism: The World of Black Sci Fi & Fantasy Culture (Lawrence Hill Books) with them in mind. I, too, discovered the term years later. I, too, was an Afrofuturist most of my life, not knowing I was an Afrofuturist, and there were, in my journalistic analysis, a legion of many who fell into the same coveted box. A book like Afrofuturism, one which collected these disparate ideas and inspirations, ranging from the music theories of Sun Ra to the sci–fi work of W.E.B. Dubois, the fiction of Octavia Butler, and the space–inspired legacies of the Dogon in one front–to–back read, could have helped some of my college peers feel more comfortable building on their ideas. It would be confirmation for some and affirmation for others that their ideals and beliefs weren’t in the realm of the unreachable fantastic. Black people are in the future, optimism is the core principal of resilience, and yes, the end of the world happened a long, long time ago. The term Afrofuturism was coined in the 90s at the dawn of the internet. Several key writers, including Kodwo Eshun, Greg Tate, Mark Sinker, and Mark Dery wrote about these issues at length. A listserve created by student–turned–professor Alondra Nelson further established the term by 2000, and the site she created became a discussion portal for students and artists wrestling with these ideas of Black people, technology, and the future. Many theorists and professional artists would emerge from these dialogues. DJ Spooky, a music innovator and theorist was among them. Poet D. Scott Miller, who would later pen the AfroSurreal Manifesto, was among them, too. Nelson’s listserv inspired academic writings on Afrofuturism, sci–fi anthologies, and conferences exploring emerging technologies and race. Digital music in urban landscapes was explored as postmodern language. Race was identified as a technology, a human–created categorization process enforced by law and violence that deemed darker people as alien. The imagination and improvisation were the mastery tools for transcending the impacts of the race technology. Valuing humanity would end the –isms, too. These works and conferences sought to give a language and academic basis for a philosophy that’s existed on this planet for a very long time. While there was one set of people actively working with the term Afrofuturism in the first decade of the millennium, there were many, many more who engaged in Afrofuturism’s wisdom, completely unaware that an emerging body of study existed. The community of Black sci–fi lovers, academics, comic fans, history buffs, and music lovers who engaged in Afrofuturist ideas were relatively unaware of one another globally. I wrote Afrofuturism hoping to bridge that gap, too. The fall of 2013 will likely be held as a turning point for Afrofuturism. The Studio Museum of Harlem hosted an Afrofuturism retrospective and season–long programming; Duke University hosted the first Race & Space Conference to explore equality on future space settlements; Bill Campbell’s anthology Mothership: Tales from Afrofuturism and Beyond, and my book Afrofuturism debuted within days of one another. The swarm of events was raining enlightenment on the senses inspired more conversation and a social media flurry. In February 2013, professor John Jennings and Adilifu Nama hosted the AstroBlackness Conference at Loyola–Marymount in Los Angeles. Sci–fi luminaries Nalo Hopkinson, Tananarive Due, Steven Barnes, and Nnedi Okorafor, along with comic book creators and theorists, delved into the politics of sharing the narrative of people of color in the future. In April 2013, producer King Britt curated MoonDance: A Night in the Afrofuture at MoMA PS1 in Queens. I had the pleasure of moderating the Afrofuturism panel. The show was a synergetic shock to the pop culture system with its alternate world digital renaissance. Hank Shocklee of Public Enemy, Hprizm, Ras G, Shabazz Palaces, Ursula Rucker, and others were featured as high points in the new era of digital music fueled by beat music and live beat composition. By September 2014, graduate students in Vanderbilt’s Theological school, inspired by the book Afrofuturism, hosted a conference on religion and Afrofuturism. Funk pioneer George Clinton was the guest speaker. Fall marked the Afrofuturist Affair’s Annual Ball in Philadelphia, an event created by Rasheedah Phillips. Last October and November, both the British Film Institute and Watershed in the UK hosted Afrofuturism film festivals. In February, Afrofuturism849, a group I created with film curator Floyd Webb kicked off Black Future Month, an Afrofuturism film series in Chicago. The Black Future Month title provided a new window for a dialogue often framed solely by the past, creating a two way conversation that amplified a visioning of a future. The title caught on. Within a year, Afrofuturism had forged new conversations in new places, serving as an anchor for feminists, advocates, educators, and artists alike, all of whom looked to Afrofuturism’s fluid intersectionality as a model for new reasoning, community building, and STEM. While Afrofuturism is viewed as a tool of empowerment for people of color, the dual aesthetic and philosophy at large serves to provide answers for a gaping hole in the story of humanity. Afrofuturism values intuition, feminine aspects of humanity, and nature. Afrofuturism views the future, past, and present as one. Afrofuturism provides a platform to explore time and memory in the context of human life. These open explorations are connections to the indigenous context for thought that once dominated our world. However, this perspective, despite the shift to modernity, did not completely eradicate these values from the ether, so to speak. Despite the undermining of African–inspired and indigenous philosophy, and contributions to humanity, these ideas lived on, sprouting up in music, literature, and daily life. When I’m asked about Afrofuturism, I usually reference my puzzled chat with my Philly–born friend as the genesis. But the truth of the matter is that Afrofuturism was the thread woven throughout much of my life. It lived with me as a child, hopping from a church rooted in metaphysics, to my Childcraft anthropology books, to my history–inspired decision to become a journalist dedicated to capturing the untold story. Afrofuturism was one of the core connectors that bound seemingly unrelated affinities in my life. It explained my infatuation with funk and house music,; my attachment to digital sounds, my love for improvisation in dance, and my affinity for science. It explained my quest to value the feminine and holistic living aspirations. It explained the belief in the power of a great vision and the fascination with the web of time and space. Afrofuturism is the window for a great many things. It closes the gap of ignored contributions of the past and opens another for the visioning of a collective harmonious future. It demonstrates the synthesis between science and history, and gives intuition the same weight that we give reasoning. This is an exciting time. In Montreal, HTMlles, a feminist coalition, coordinated the Zero Future Conference. The event, held in November of 2014, proposed that the future we were sold some decades ago was a commodified vision that didn’t engage the larger world. A few years deep into the second decade of the 21st century, the conference proposed that we are now at Ground Zero and desperately in need of a new future. Afrofuturism was a major theme at this conference. I had the honor of speaking and quickly recognized that many people are in need of a dose of deep–rooted optimism. People are craving an empowered imagination. For many, Afrofuturism inspires that latent feeling of hope. Challenging weighted cynicism to protect the imagination is crucial. Afrofuturism values the imagination, knowing that the future is now and yes, that future is you. Ytasha L. Womack is an award-winning producer, director, author, and innovator. She is author of the critically acclaimed books Afrofuturism: The World of Black Sci Fi & Fantasy Culture, Rayla 2212, Post Black: How a New Generation is Redefining African American Identity; and co-edited Beats Rhymes and Life: What We Love and Hate About Hip Hop. Afrofuturism is a 2014 Locus Awards Nonfiction Finalist, and Post Black was hailed as a Booklist Top 10 Black History Reader of 2010. Her films include Love Shorts and The Engagement. The Engagement was nominated for Best Film at the American Black Film Festival. A Chicago native, she recently co-founded Afrofuturism849 to host discussions and events in Afrofuturism. She shoots her sci-fi film Bar Star City later this year.